Residents of the South Coast Air Quality Management District (SCAQMD), which includes the urban portions of the Los Angeles, Riverside, and San Bernardino counties, and the county of Orange, suffer from the worst air quality in the nation. Now SCAQMD has launched the nation’s first fully featured smart-phone application for a wide range of air quality information. •	What Can I Do – Summarizes current air quality issues and provides tips on how to clean the air. •	Clean Air Congress – Provides an opportunity for the public to join the fight for clean air, participate in the regulatory process, subscribe to the Air Bulletin Newsletter, and contact the District. 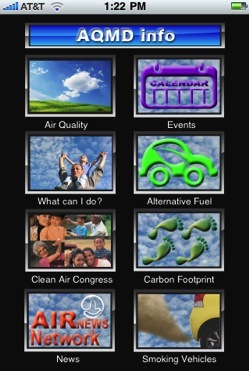 •	News – Provides information on air quality news, podcast, and options to sign-up for air quality alerts. •	Events – Lists air quality events including Governing Board meetings, committee meetings, conferences, town hall meetings, and workshops. •	Alternative Fuel – Provides locations, directions and details on alternative fueling stations (i.e. -natural gas, hydrogen, electric and propane) within the South Coast Basin. •	Carbon Footprint – Contains a calculator to calculate your carbon footprint and tips on how to reduce the carbon footprint and the production of green house gases. •	Smoking Vehicles – Provides an opportunity to report air quality problems and/or smoking vehicles with excessive tailpipe smoke emissions. SCAQMD is the largest Air District in the Country and is responsible for cleaning our air and protecting air quality for approximately 17 million people living in an area of over 10,000 square miles.